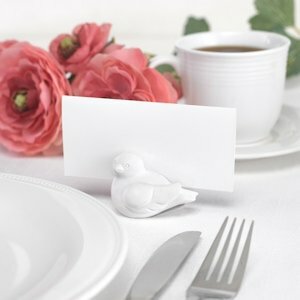 Place these Love Bird Card Holders on your tables as a charming accent and also to help your guests find their seats. Sold in a set of 6, the white resin birds are full of details and are complete with a slot that will hold a place card, table number, note or photo. You can even give them to your guests after the celebration as a thoughtful take home favor! They measure approximately 2.5" long x 1.5" tall.